Today, at around 07:35 AM, our family had lost one of our beloved member, who was always cheerful and excited to greet us everytime the morning comes. She rested in peace, in the presence of all of our family members, and she even gave her last breath in my caring comforting hands. She had finally left the world to meet my late Father, who loved her so much even until the day he went to heaven. Bhu-bhu is with him now, after taking over his place as the lively member of our small family. It's a sad day to every member of our family, that even our flowing tears could never describe how precious she was to each and every one of us. Now... her shouting, caring nature, and gentle behaviors will continue to live on, not in physical, but in memory, deep inside our hearts. No longer can I see her moving her small body towards me, no longer can I see her kind and comforting gaze and loud calling whenever I return home. ... but I know for sure, she's in a happy place now, and she'll always be looking at me with her happy wheek from Heaven above. One thing for sure, she will deeply be missed by not just me, but every member of our family. This day, I've lost not just a pet, yes she's more than just a pet... I've lost a family member! I've also lost an important piece of my life, someone who had always been a true friend, who never left my side (not once) and who'd always provide comfort during my dark days, someone who always reminded me that I'm never alone, even when I've lost my faith to the world. Not with speech or sweet talks, but simply by being there and present beside me. In her own magical way, she showed me what a true friend should've been. The image of a true friend a guy could've ever asked for. I've lost the one and only true friend I had left in this dark and cruel world. She's suffering a great pain, and is shaking (still is until now), and it seemed like she's feeling cold. Today, I could obviously see the pain that she tried to endure in her eyes, they're not as bright as even yesterday. She's definitely crying, especially when we tried to pet her. We're going to take her back to the Vet later on 09.00AM... I hope she still had a chance to continue another day, she's definitely trying very hard to be healthy but in the end, all lifes are in God's hand... T_T. Perhaps I've been too evil enough for Him to hear my continuous prayer though... sometime I wonder if He ever listen to me at all. Wish He actually would this time, cause Bhu-bhu is no ordinary pet, she's one of our family, more than that... she's probably the one and only true/best friend I had left today. Well, perhaps I spoke a bit too soon about how the Vet was a savior (on my Friday's post)... the correct word would be 'Available In Time? ', hmmm... don't know what the suitable word though. But yeah, my Cavy's not cured yet, but if we hadn't took her to the Vet that day, she would've been gone for good the same day. Basically my Cavy's condition went worst yesterday and she's still struggling and shaking up until now. Friday night, she was already eating as usual, but yesterday she couldn't eat anything at all, that we even had to feed him with blended food. My guess is, the medicine was starting to work, and that had a downside effect making her body weak and shaky. It's definitely very painful to see, because she used to be so lively and cheerful. Now, she's very skinny and fragile, and her body felt cold as well. Despite that though, she's still responsive, and always turned to gaze us whenever we called her. She's still trying with the small strength she had left to eat something, though simply couldn't eat more than a small bite. I think she still has the will and passion to live, it's obvious she's still struggling her best to do so... and that's already a good thing. *EDIT* Here's her most recent photo, taken on Monday (January 21st) when my family returned from Malaysia. She was still in full health, and was very excited to see everyone again. The Vet is a Savior!!! We found our beloved cavy (Guinea Pig) Bhu-bhu was very ill this morning. She's not greeting anyone who woke up at dawn while she usually was very loud and active to see any member of our family everyday. After that she didn't eat any of the food she was feeded, and she looked very weak as well. Thankfully the veterinary was available, so she was able to be taken to the doctor before noon (Guess what! this is already her 4th visit since she was only several months old). Apparently she had some bruises on her paws, and also a dysentery due to eating unhealthy food. We suspected it was because of the lettuce (my uncle who bought it apparently likes to ask the grocer to add extra left-overs from his waste-bag T_T). She was fortunate because we've lost our previous pet (a hamster we called Putih -in english means White) due to the same disease several years ago. I had this eerie feeling that we might've lost her for good if we hadn't took her in time. The vet feeded her some oral vitamins and medicine, and gave some to be taken later at home. She also got the treatment for her paws. She still refused to eat after she returned home, but thankfully... when I returned home from my tutor-work this evening, she's seemingly back with her appetite, and ate all the grass that I picked for her along the way home. I can even hear her eating some new grass while I'm typing this post. She's going to have her 2nd round of medicine tonight, and hopefully, she'll regain her usual perky attitude and will be alot better tomorrow. 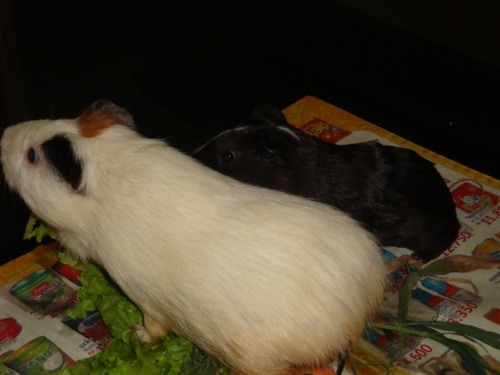 Here's her picture (the white one), taken last August along with my aunt's cavy. I've posted that on my tumblr. Well, one should never relate a single Sunday to a whole year anyway... but for me, this bad weather is indeed a bad sign. I've been down with cold and heavy flu since Thursday, and was kinda hoping I'd get better if I rest for a while to avoid further illness on Monday. However, I've already caught my daily insomnia (I woke up at 2 AM today), and the chill from the weather is definitely not doing any good to my body.